Every time your brain has a success, you just changed the goalpost of what success looked like. You got good grades, now you have to get better grades, you got into a good school and after you get into a better one, you got a good job, now you have to get a better job, you hit your sales target, we’re going to change it. And if happiness is on the opposite side of success, your brain never gets there. We’ve pushed happiness over the cognitive horizon, as a society. And that’s because we think we have to be successful, then we’ll be happier. The research outcomes show that taking care of how we think really matters, and flooding our brains with self-generated, positive mood enhancing chemicals is possible. Neuroscience shows meditation and exercise are levers for this, and social science knows that positive social support and contact do it too. Today through Madam Heap, Mandy and Carrie provide classes and courses for the general public, companies and schools helping people to take care of there mental health. And they run terrific community events like The Mindful Walk coming up on Sunday 18 February, as a means to raise money for suicide prevention, and create social opportunities for people interested in mindful living. The happiness advantage starts with the conscious choice to change the way we think – to know that we can positively craft the way we’re currently working, living and loving. It is the prelude towards taking a happy leap towards success on our own terms. Join me at The Mindful Walk in St Kilda on 18 February here. News presenter. I don’t really know why, or where this came from, although people often say what you wanted to be when you were young is a really good indication of your purpose or talents. And when I look back on this, I do think a lot of my work and calling has been presenting information especially the latest trends, being IT when I first started (as back then IT was really a new and upcoming area). And now mindfulness and meditation similarly being a new area, (although actually very old) it’s new to the western world and particularly the business world. Astronaut, because I had astronaut Barbie. Bachelor of IT, which was focused on the business side of IT. More recently, meditation teaching. From the corporate business/sales world to Meditation/Mindfulness Teacher and business owner of Madam Heap. Madam Heap, the school of mindful living, was designed (with business partner Carrie Hayward, a psychologist by trade) to help bring meditation and mindfulness to the wider community. We run a variety of courses and events at our studio in Middle Park with Melbourne’s best teachers. As well as provide training for businesses wanting to teach their employees mindfulness’s skills. I was working in sales and business development for an IT Consulting firm and had been working in that world for over 10 years. Very much a high paced, highly stressed work, and particularly being in the sales domain, you working life is completely obsessed with meeting your sales targets. There is so much pressure to meet your targets. 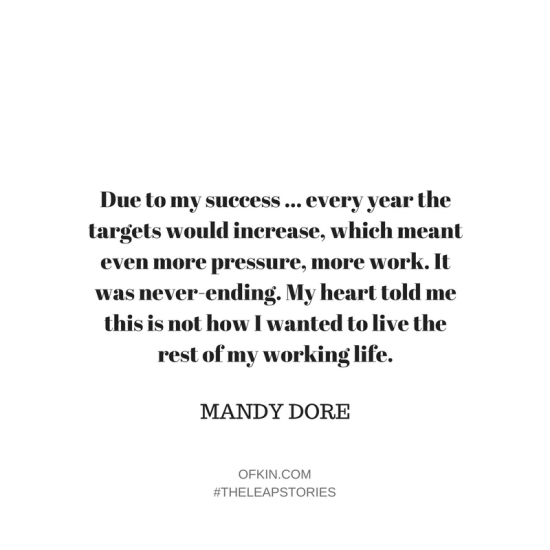 And although I was always meeting my targets due to my drive and determination, it did mean due to my success that every year the targets would increase, which meant even more pressure, more work. It was never-ending. My heart told me this is not how I wanted to live the rest of my working life. I started to think about what was important in my life, what would I look back on in my older age or perhaps when I was dying and be satisfied with, be proud of, or what I might regret. This guided me to re-think my life and my priorities. A previous mentor, who mentored me in my 20s, a rather worldly man who guided me to take a leap in my 20s from a very good job to moving overseas. My family, for instilling a work ethic and determination in me. My partner for supporting me in taking a leap from a highly paid employment to following my passion to teach meditation! Time – I gave myself time by leaving my job before making the leap into my new business. Whilst in my current job I couldn’t work out what my next step was. I needed time off, to de-stress, to live life a little, to spend time listening to myself and bouncing ideas off trusted friends. The support of a partner. A knowing that if I follow my passion and heart, everything will work out. It had been building for a while, I started dreading Mondays, something I never really experienced to this degree. I wasn’t passionate about my work anymore and felt like I was faking it. I knew I couldn’t go on living like that, it just wasn’t my style. 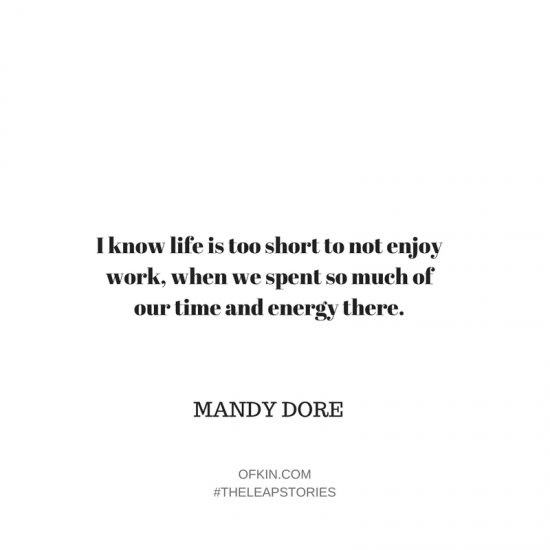 I know life is too short to not enjoy work, when we spent so much of our time and energy there. One weekend, I came very close to making the decision to leave, and on Monday morning, I learnt the dreadful news that the husband of one my colleagues had passed away suddenly over that weekend. This colleague of mine, I really liked – we were similar, and I could very much relate to her. So it felt like it could have just as easily been me, that lost my partner that weekend. So that was it! I was reminded how precious life is, and it’s not to be wasted, I couldn’t not make the most of life right now! I resigned that week. I didn’t know what I was going to do, or what my next step was, I just took that leap and believed it was all going to somehow work out! 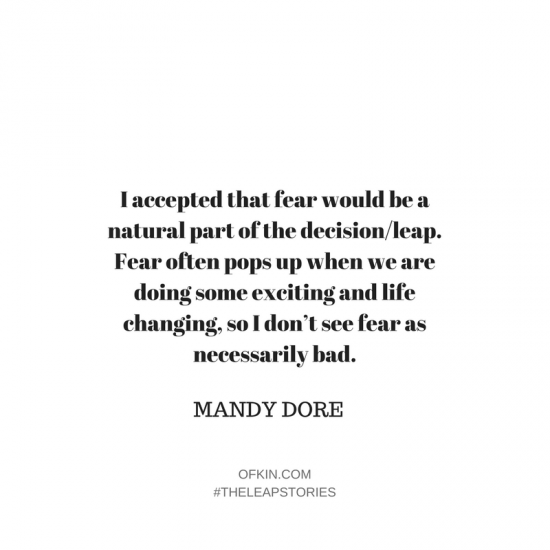 I accepted that fear would be a natural part of the decision/leap. Fear often pops up when we are doing some exciting and life-changing, so I don’t see fear as necessarily bad. Yes, it could have all gone wrong, but I also knew if it didn’t work out, I could always go back and get a similar job. At the same time, I knew if I stayed, I wouldn’t be true to myself, I would have to continue to fake it, and slowly my love of life would have whittled away. I would live to regret it! In the end, I focused on my priorities which were to be happy, to have a family (which I didn’t see as a good fit with my existing job), and to make the most of this life! So when I focused on that, courage came naturally. Savings. And the support of my partner. In my late 20s, I was in a very good job, well-paid, that I really enjoyed. It was a fantastic organisation with a great bunch of people, and as I had been there for many years I felt a sense of loyalty to them. However I always had the passion to travel, and specifically to live in Europe, so I put that intention out, and it came back with an offer for an international job based in Germany. So I left that great job in Melbourne, my family and I also left my partner of many years at the time, and went and lived on the other side of the world where I didn’t know anyone, nor could I speak the language. Of course, it was a scary leap, but what an exciting one! I ended up living there for over 4 years, and with my work travelled Europe and American. I met amazing people, had wild experiences, saw so much of the world and so much fun I will never forget! I look back and think thank god I took that leap! Other leaps I’ve taken is becoming a mother, a challenging leap but also so beautiful and for me, such a meaningful and natural leap. And the current leap I’m working on with my business partner of Madam Heap, Carrie Hayward, is the Mindful Walk. A community event like no other! Our intention behind The Mindful Walk is to provide a unique and inspirational community event that is focused on doing something good for our own souls while helping others at the same time. To walk mindfully… in silence… alongside others.. and within nature… is such a wholesome and powerful connective experience. We were therefore keen to create the opportunity for individuals in the community to experience this together. And we thought that this would become even more meaningful to not only reconnect ourselves but to also connect to a greater cause. Choosing to walk for mental illness awareness and suicide prevention by all profits going to not for profit Livin was a ‘no-brainer’ given that the absence of mindfulness (i.e. disconnection to ourselves, the world and each other) is a significant contributor to mental illness. The Mindful Walk is therefore simply about connection, on so many levels. Its something that has never been done in this format, and we think it will be really special. We are very excited about it! Hmmm… perhaps I’ve been lucky, my leaps have all worked out so far. I’m fearful of death, of leaving my daughter behind before I’m ready. Or losing those I love around me. Happiness. Following my passion, which means I enjoy working, and I feel empowered. I feel like I am making a positive difference with the work I do. By helping people discover meditation and mindfulness and the different practices, therefore making a difference to their lives. This feels special to me. If I’m honest I do sometimes miss the financial security I had with a high paying job. But I get through with reminding myself I could always go back and get a high paying job. But do I want to!? Nope! 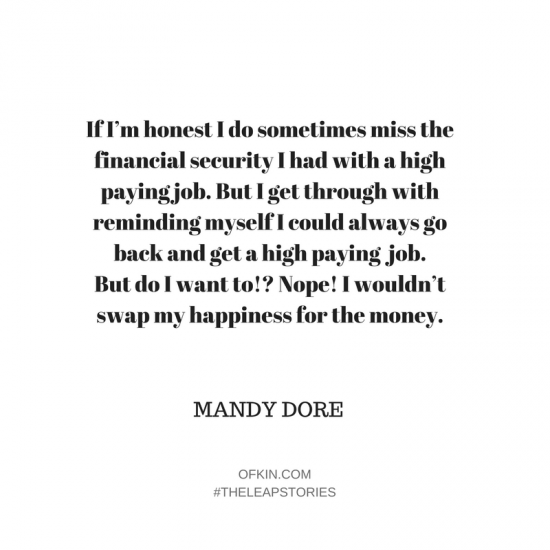 I wouldn’t swap my happiness for the money. Hmmm… Let’s wait and see… We’ll see what the feedback is to the Mindful Walk is and where that make takes us. But I do believe whatever my next leap is, it will likely continue to be in this space, of bringing mindfulness & meditation to the wider community. Erin Kyna is definitely someone I admire who made the leap, from Flight Attendant to Meditation Teacher to now what I call “Spiritual Nomad”. She travels the world with no home, in total flow, being guided by her heart and intuition every day, and as a result, all sorts of crazy synchronicities continually happen in her life guiding her to whoever and wherever she is meant to be. Just do it. Life is too short. Imagine it was the end of your life, and you were looking back? 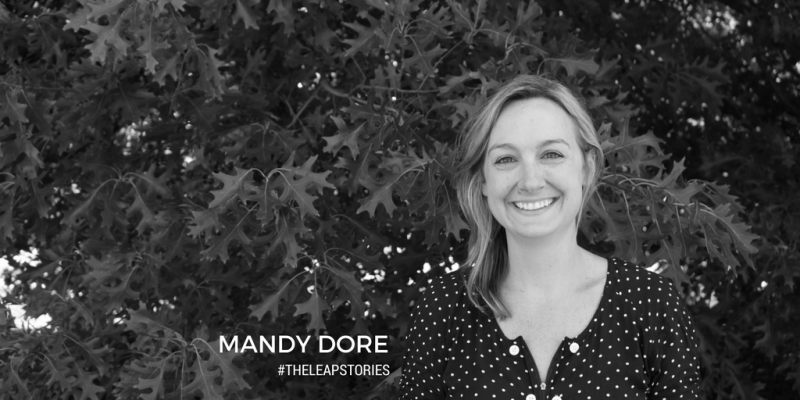 What advice would you give yourself about the leap? How did you know the leap was the right leap? I sat with it. I left my job and gave myself some time to ponder. I meditated. 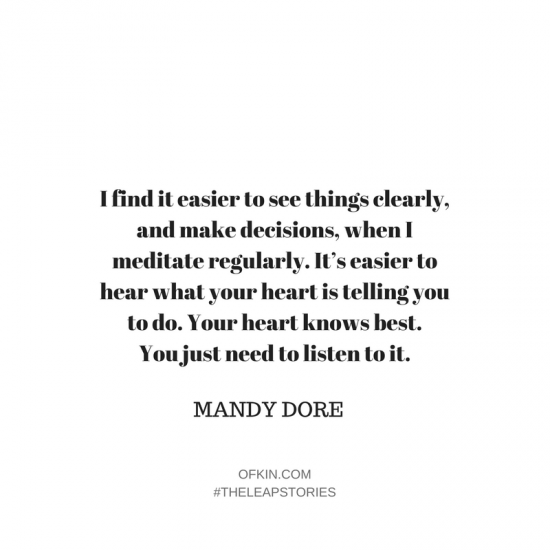 I find it easier to see things clearly, and make decisions when I meditate regularly. It’s easier to hear what your heart is telling you to do. Your heart knows best. You just need to listen to it. Reading: When Breath Becomes Air by Paul Kalanithi, a recommendation from our Madam Heap Instagram followers when I did a post asking for books that had the greatest impact on your life. Loving: My partner and my daughter (she is super cute, and the most determined individual I’ve ever met, I wouldn’t change her for the world, even though it’s hard sometimes). The antidote to overwhelm, powerlessness and frenzy is calm, clarity, purpose and community. Instead of our lives tumbling ahead of us, we can make space to take mindful, courageous, intentional leaps. We can nudge our negative thoughts towards optimism, and we can build a happy life on our terms. And it can start simply with taking slow, deep, full breaths. ps. Come for a walk with me next Sunday, 18 February in St Kilda!